Brawlhalla has been bumped up to Version 3.33, and it includes all sorts of new content and tweaks. Check out the full patch notes below. From deep within the Fangwild, introducing Dusk, the Renegade Sorcerer! Wielding a new Weapon made from stone and magic, Dusk utilizes his magic Orb and Spear on a conquest to overthrow both Aelfheim and Asgard. We also have Rayman debuting for the first time on the Legend Rotation and have his price reduced to 5400 Gold! Additionally, we’ve made some improvements for consoles, updated controller options, bug fixes, and more! Improved UI legibility for the Nintendo Switch in handheld mode. If you’re on Steam, PS4, or XBox One, this is the joystick interpretation you’re used to. PC: Fixed a bug where pressing Enter while spectating would open the pause menu instead of opening chat. PC: Fixed a bug where pressing Enter to change the sort method on the Meet the Legends screen wouldn’t work if you’re in a clan, because it would get caught by the Chat Box. This week Rayman makes his first debut on the Rotation list! The new Legend rotation also includes: Asuri, Cassidy, Koji, Scarlet, Jiro, Xull, and Queen Nai. Rayman – The Champion of the Glade of Dreams, wielding his Gauntlets and Axe, has found his way into Valhalla on a mission to save his home. Thanks to Atebit for the heads up! From the Dream Forest to the Great Hall, we are excited to announce Rayman, Champion of the Glade of Dreams, as a new Legend! He finds himself in Valhalla, set on a quest to discover how to truly save his home. He uses Gauntlets and Axe to take down giant dragon bosses and any opponents participating in the Grand Tournament, in order to win the ultimate prize. Globox and Barbara also join the action as Epic Crossover Skins! On his arrival, Rayman taught the denizens of Valhalla how to play Kung Foot; join the fun in the BotW. Make sure to check out the fantastic Rayman-themed items in Mallhalla as well. We’re also running a Rayman event to top it all off! Yahoo! SAN FRANCISCO — November 6, 2018 — Today, Ubisoft announced that Brawlhalla®, its free-to-play platform fighter game with more than 15 million players on PC and PlayStation®4 computer entertainment system, is now also available on the Xbox One family of devices including Xbox One X, and Nintendo Switch™ system. 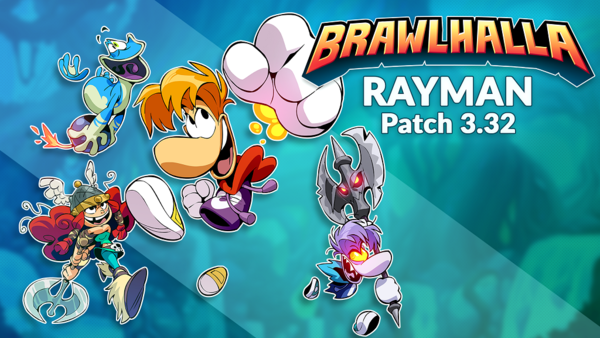 Additionally, an update across all available platforms (Nintendo Switch, Xbox One, PlayStation 4 computer entertainment system and PC) adds Ubisoft’s Rayman® into Brawlhalla’s colorful cast of Legends, new skins from Rayman’s universe of characters and a new Kung Foot mode. During the three-week Rayman event, Kung Foot will replace the Brawl of the Week, so you can queue for Kung Foot matches as well as play with your friends locally or online. The default mode is 2v2, but in couch mode and custom lobbies, you can create Kung Foot games with anywhere from two to eight players. Brawlhalla is getting brought up to Version 3.32 on Nov. 6th, 2018. The patch's biggest change is the addition of Rayman, but there's a lot more going on as well! For some, the addition of Rayman to Brawlhalla will be enough to purchase the game. Could you be one of those people? Check out the Rayman event footage above and see if it tickles your fancy!